A condensed version of the article below originally appeared as a guest post on BookBub's Unbound blog. 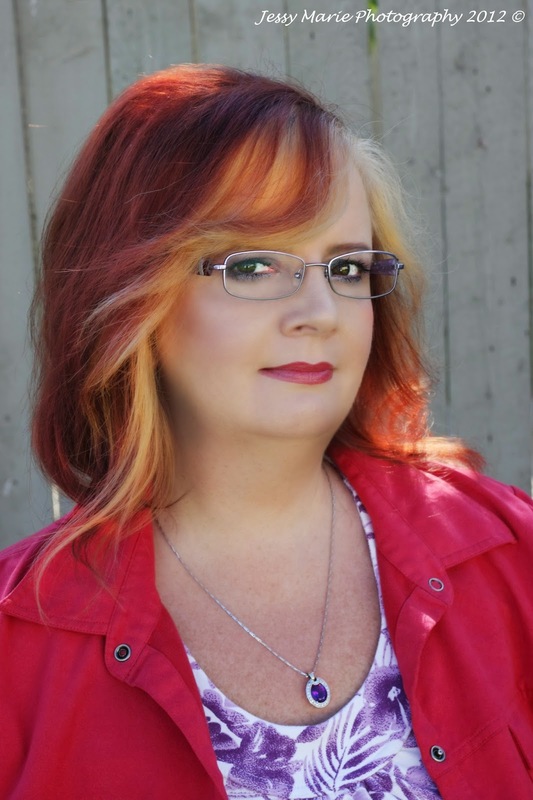 As a bestselling suspense author who has been indie published since 2003, I've learned that being flexible and open to learning and adapting to change is key to being successful in this industry, and success for a professional career author should be defined by sales and income, though there are other indicators of success. Too many authors schedule discount sales, post a couple of Facebook posts and send out a few tweets and then complain about lack of sales. Some do many small promotions, paying for 1-2 inexpensive advertising spots each time, and again don’t see high sales. Promos like these might get your book on a Top 100 genre bestseller list on Amazon, but they’re not enough to produce high sales. You need to understand that watering down the impact of a discount sale by doing them too often just isn’t the way to go. You’re better off saving your advertising budget for a MAJOR promotion, and by “MAJOR” I mean spending $600-1200, and running 1-2 major promos a year per title. This is an investment in your career, in your work and in you. Today, I’ll share some stats on my last major BookBub promotion, detailing my recent experience with a BookBub promo, so that you can see what advertising on book sites can do for sales. First, I selected a book that has sold well but had never been on BookBub before or priced at $0.99 for many months. I chose SUBMERGED, a standalone thriller with tie-ins to my #1 bestseller, CHILDREN OF THE FOG. When I run a promotion for one title, there is always a strong possibility that some of my other titles will see an increase in sales too. I decided to run a Countdown/BookBub combination promo, since Countdown deals get extra exposure from Amazon, and they create a bit more excitement. I determined I would only run this promo if BookBub accepted SUBMERGED (they'd turned it down numerous times in the past), so the first thing I did was pitch my book to BookBub, letting them know that my dates were very flexible. I requested a date close to the end of the month—payday. I did not book any other ads until after I had a BookBub date. Once my BookBub ad was secured, I used that date as Day 1 of my Countdown promo and set up both US and UK Amazons. (Since we only get one Countdown promo every 90 days, you may as well do both Amazons.) I used all 7 days because it can take a few days to get into the overall Top 100 on Amazon, and I wanted to stay there as long as possible, building momentum. My promo for SUBMERGED was set for the last few days of October and first few days of November, from October 28 - November 3rd (evening). This worked out great because most people are paid at the end of the month. I’ve found better success when I run a promo during a payday—15th and 30th. I priced SUBMERGED at $0.99. I selected this price as this title had only been on sale for $0.99 once before, and that was when the SUBMERGED was first published, 8 months earlier. Then I purchased other advertising, including Kindle Nation Daily, Fussy Librarian, BookSends, Story Finds, Bargain Booksy, Digital Book Today, Ereader News Today, The Kindle Book Review and more. 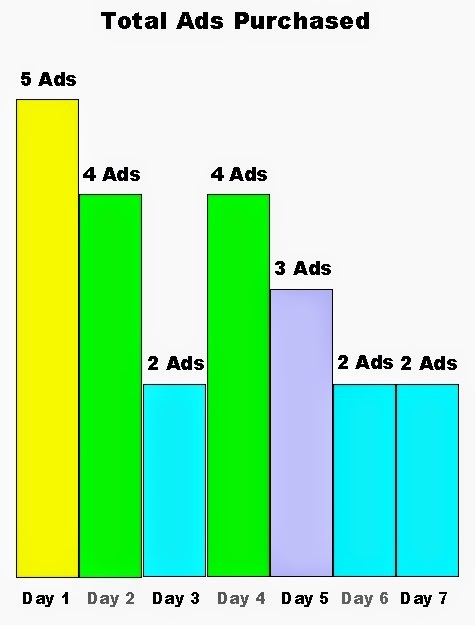 Four of the above ads were free for various reasons; 18 ads were paid. I paid a total of $1214 for 22 ads. I also set up various tweets to go out every couple of hours at random times each day of the promotion. During the promotion, I posted various updates to my Facebook pages, creating excitement and getting my readers and fans involved in where I was in my promotion. I used screen captures to show them when I made the lists. I had screen captures that showed where my book stood in relation to other Big-Name authors. It’s important to note that prior to this promo and during the first 27 days of October, I had only sold 26 copies of SUBMERGED across Amazon.com and Amazon.co.uk. 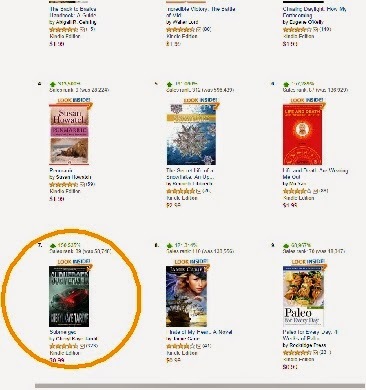 On Day 1 (Tuesday) SUBMERGED made Amazon's Top 100 overall bestseller list, which provides extra exposure to potential new readers. (This is the first time I made the Top 100 overall on the 1st day of a promo.) SUBMERGED remained in the Top 100 overall for the first 3 days of my promo. It remained in the Top 1000 overall for a week and in the Top 5000 overall for almost 2 weeks. SUBMERGED also made Amazon.com’s Top 100 Movers & Shakers list, which provides extra exposure to potential new readers. In the first 4 days of my promo (October 28-31) I sold* 2421 copies of SUBMERGED. Approx. 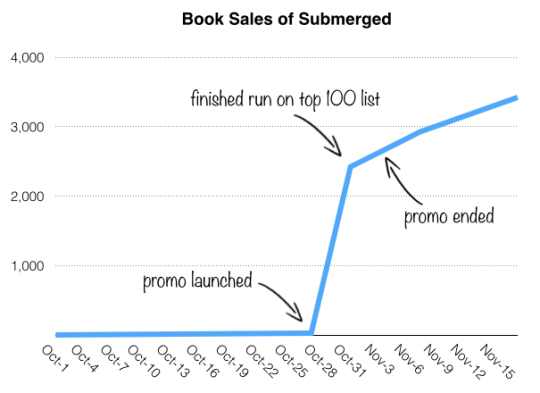 500 copies of SUBMERGED sold* in the first week of November (Nov 1-3). In the first 17 days of November I sold* 1000 copies of SUBMERGED. I sold* a total of 3421 copies of SUBMERGED on Amazon.com and Amazon.co.uk during my promo and in the 14 days afterward. Three of my other titles’ sales increased approx. 50% during and after the time SUBMERGED was on the Countdown deal. SUBMERGED, sold from October 28 to November 3 inclusive, was on sale for $0.99, which earned me a 70% royalty (a perk of the Countdown deals) for most, or were KOLL/KU sales. I earned $1633 for SUBMERGED sales* in October; the majority of that income was created in the last 4 days of October. When my Countdown deal was over, SUBMERGED sold for $4.99, which also earned me 70% royalties for most. I earned approx. $3000 for SUBMERGED sales* in the first 2 weeks of November. And even after those first 2 weeks, I still saw an increase in sales of SUBMERGED. Many of my other titles continued to sell at a higher rate than before this Countdown/BookBub promo. I earned an approx. total of $4633 for SUBMERGED sales* during my BookBub/Countdown promo and in the 2 weeks following. I averaged a royalty of $1.36/sale. * From the $4633 I earned during this promo from one single title, I paid $1214 for 22 ads, which results in a $3419 profit. If I had to split my profit with a publisher at 50%, I still would have earned $1709.50 for this one single title and I still would’ve seen a profit. My takeaway: RUNNING A BOOKBUB PROMO WITH A SELECT COUNTDOWN DEAL WORKS! I will do this again…and again. PS: If BookBub turns one of your books down, try, try again! *Sales data marked with an asterisk includes Countdown sales or after-Countdown sales plus KOLL and KU. 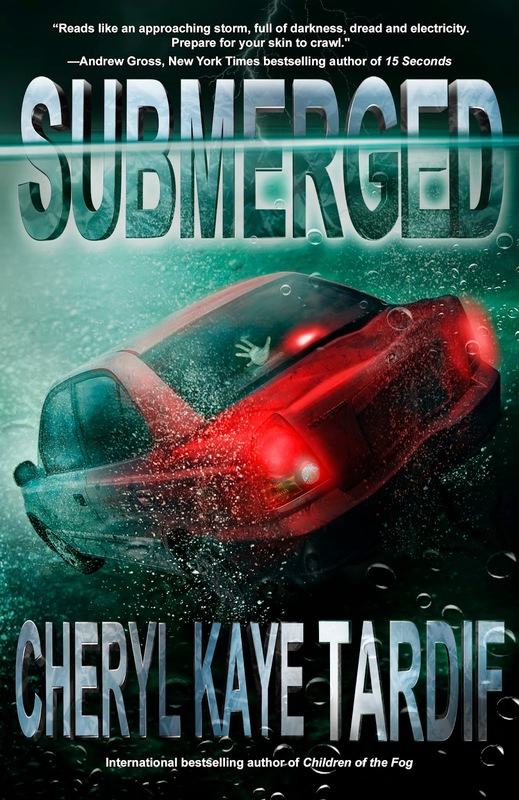 To summarize, I put SUBMERGED (a psychological thriller) on sale for $0.99 via a KDP Countdown deal on Amazon.com and Amazon.co.uk from October 28 to November 17, 2015, and I sold 3421 copies. I paid $1214 for 22 ads (including BookBub--$500 Thrillers category), leaving me with a profit of $3419. Authors: Submit your book to BookBub, and follow a similar marketing plan if they accept your work. I am sure you'll see great results. PS: I recently did a similar BookBub promo for my DIVINE TRILOGY, and it too was a success and sold thousands of copies during my promo--and after. That is a really good return. Your plan involves a lot of determination and savvy. Wish I could get a prescription for that. Determination, yes. But savvy? Not really. It's easy to buy advertising and watch the sales go up. One thing I've learned is that you have to SPEND money to EARN money.